^ Page, Myra; Baker, Christina Looper (1996). In a Generous Spirit: A First-Person Biography of Myra Page. University of Illinois Press. p. 145. ISBN 9780252065439. Retrieved 4 August 2018. ^ Celizic, Mike (2 June 2008). "New footage of Marilyn Monroe, Clark Gable revealed". Today. Retrieved 22 April 2018. ^ a b "American Masters: Elia Kazan". PBS. 2003-09-03. Archived from the original on September 23, 2006. Retrieved September 22, 2006. ^ Sklar, Robert. "On The Waterfront" (PDF). Library of Congress. Retrieved 2018-12-27. ^ Drury, Allen (1956-06-22). "Arthur Miller Admits Helping Communist-Front Groups in '40's". The New York Times. Retrieved 2016-06-07. ^ Glass, Andrew (21 June 2013). "Arthur Miller testifies before HUAC, June 21, 1956". 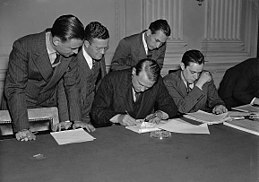 Politico. Retrieved 3 October 2016. ^ "Four Freedoms Awards". Archived from the original on March 25, 2015. Retrieved 2015-04-04. 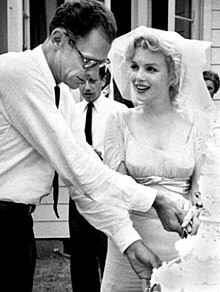 ^ "Arthur Miller: An Inventory of His Collection at the Harry Ransom Center". norman.hrc.utexas.edu. Retrieved 2018-01-10. 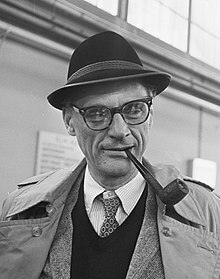 ^ "Playwright Arthur Miller's archive comes to the Harry Ransom Center". sites.utexas.edu. Retrieved 2018-01-10. ^ Schuessler, Jennifer (2018). "Inside the Battle for Arthur Miller's Archive". The New York Times. ISSN 0362-4331. Retrieved 2018-01-10. ^ PAUL KENGOR (16 October 2015). 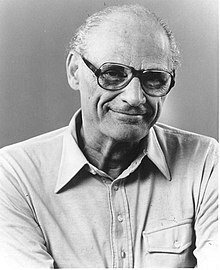 "Arthur Miller – Communist". The American Spectator. Retrieved 18 March 2018. Wald discovered that Miller published in New Masses under the pseudonym of “Matt Wayne” from March 1945 to March 1946.